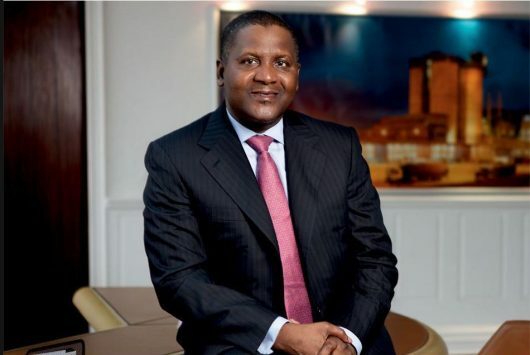 The Dangote Group is set to deepen its investments in Niger State, representative of the Group at the State’s Trade Fair, Bello Danmusa has revealed. He said Niger State has all it takes to industrialized given its vast land and natural resources, even as he commended the government of Abubakar Sani Bello for being proactive in the partnership with the Dangote Group and other private sector investors. Wife of the Governor, Dr Amina Sani Bello, who declared the Dangote Day open said the contribution of the Group to the development of Niger State is incalculable. President of the Niger Chamber of Commerce Industry, Mines and Agriculture (NCCIMA) Dr Umar Ahmed Bakai commended the Dangote Group for supporting and sponsoring the Trade Fair, adding that Alhaji Aliko Dangote has helped in job creation in the state. He called on other investors in the country to emulate Mr. Dangote. Speaking also, Chairman House of Assembly Committee on Investment Muhammad Nurudeen said the State House of Assembly welcomes private sector participation in driving the economy of the state. Permanent Secretary, Ministry of Commerce and Investment Uthman Shehu urged the Dangote Group to scale up its investments in Shea Butter, saying the State has about 64% share of the total global shea butter production. Africa’s industrial giant-Dangote Group-said its sponsorship of the ongoing Niger State Trade Fair was part of its commitments to support states toward the industrialization of Nigeria. In partnership with states’ Chambers of Commerce, the Group has, over the years, sponsored most of the Trade Fairs across the country, a statement from the Group’s Corporate Communications Department said. It said Niger State has vast arable land, mineral resources and great potentials for industrialization, adding that Governor Abubakar Sani Bello has taken the path to industrialization and job creation through his government’s partnership with the private sector. The Trade Fair which opened on Saturday July 29, is expected to close on Thursday July 9, 2018. Director General of Niger Chamber of Commerce Industry, Mines and Agriculture(NCCIMA), Adamu Salihu, said the partnership between the Dangote Group and his Chamber is robust as the conglomerate is the biggest promoter of agriculture and solid minerals in Nigeria. He said about 10 states, 12 Federal agencies and not fewer than a thousand traders were participating in this years’ fair. Our reporter said the Dangote pavilion at the Trade Fair is a Mecca of a sort as participants thronged the pavilion to have a glimpse of its innovative products, while others want to be distributors for the company. Some of the products with pocket friendly prices on display include the recently improved pasta (Slim spaghetti and macroni), cement, Dan-Q Seasoning, sachet sugar, salt among others. It said the participation of the Group was part of the strategic move to grow market share and expand customer reach.